Hecataeus and Herodotus knew of several cities of Thracians in the Chalcidice and east of it, notably those of the Edonians. We know only some of their cemeteries, e.g. Sindos. Little is known of similar early Thracian urban settlements in Bithynia and Mysia, but they were already called cities by the early Greek historians (Herod. II,2, 23, I, 24, I, 124,2 and 126,1). Those situated east of the Vardar – Axios seem to have developed from earlier settlements on the toumbas, selištne mogili, like Kastanas, Assiros and the Toumba of Thessaloniki ( Cf. esp. the series of the Kastanas publications edited by B. Hänsel) . New excavations have revealed more of them in Chalcidice (Bouzek 1997, 79-80, 246-249). Koprivlen may have had a history similar to Assiros and Kastanas. 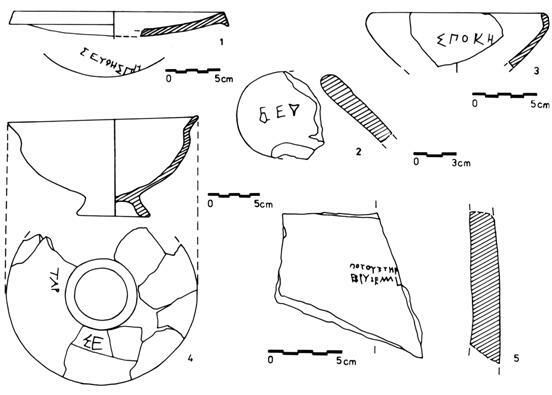 There are imports of Greek 6 th century pottery there similar to what is found in comparable sites further south, and also a Late Bronze Age predecessor (Božkova et alii 1998, Delev et alii 2000). The small daughter cities of main Greek apoikias, on both the Aegean and Black Sea coasts, were called emporia. These emporia were usually something half-way between a village and a city. They were situated in the chora of the Greek cities (as seen around Histria and Olbia), but in early times the chora was rarely – as Ettore Lepore would say – territorio cittadino, but a mere zona di influenza. The Thucydidean towers” were apparently small forts with some military and governmental function, but not yet real towns, as their industrial and trade activities were very limited. While Nebettepe of Plovdiv in view of its size – before the time of Philip II - was probably one of the thyrseis, Vasil Levski and the fort on the Mandren lake (Balabanov 1984, 1986) were places where influential reguli lived and had their representative manors. Pistiros after its monumental fortifications built in the third quarter of the 5 th century B.C. became an undoubtedly urban structure, with kleroi, a regular network of streets and insulae. The Vetren tumulus situated only a few hundred meters from Pistiros (Venedikov 1946) and dated ca. 400 B.C. 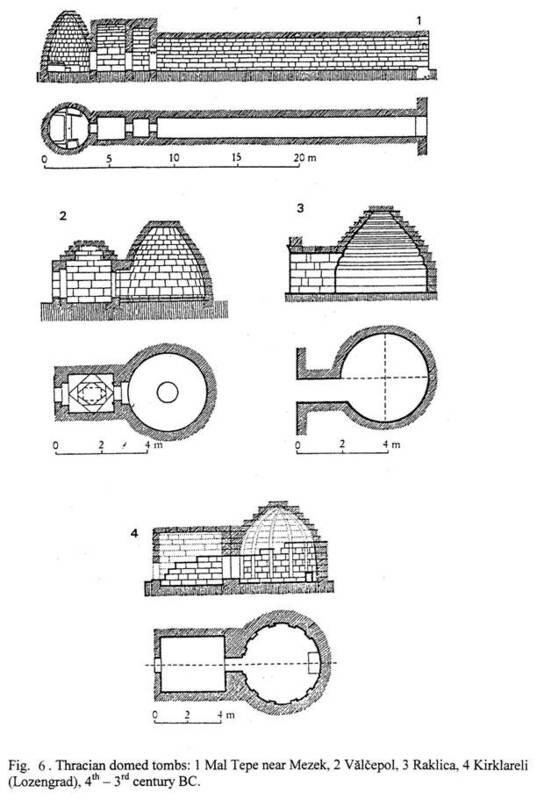 shows exactly the same technique of working stone as was used in the Pistiros city wall of the 5 th century (Fig. 2). 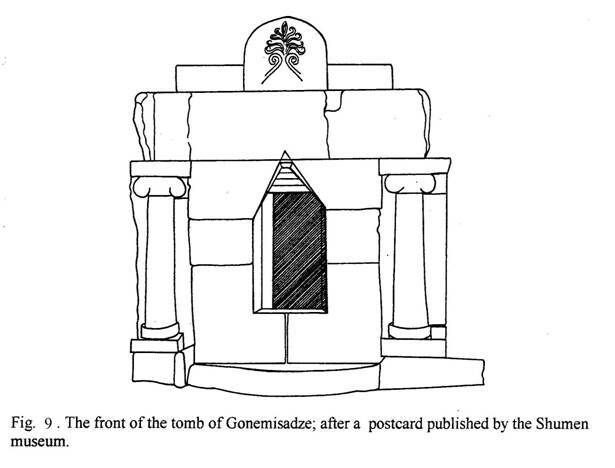 As this is the time of the rise of the monumental tomb construction in Bulgaria south of Stara Planina, stonecutters from Pistiros may well have been teachers of local Thracian artisans, and the nobleman buried in the Vetren tomb the local regulus who enabled the Greeks to found the emporium there. Pistiros had not only a regular city plan with streets surrounded by colonnades, but also a sophisticated sewage system (Fig. 3). From the famous inscription and from graffiti we know that it also had some kind of self-governing body, a city council (Bouzek et alii, eds. 1997, 2002). The two kinds of loom weights, testify to two traditions of textile working. The fiddle-shaped weights are only known from Thracian sites, not from Greek cities; they were probably made by Thracian women; most of the weights known from Pistiros were of the fiddle-shaped class. 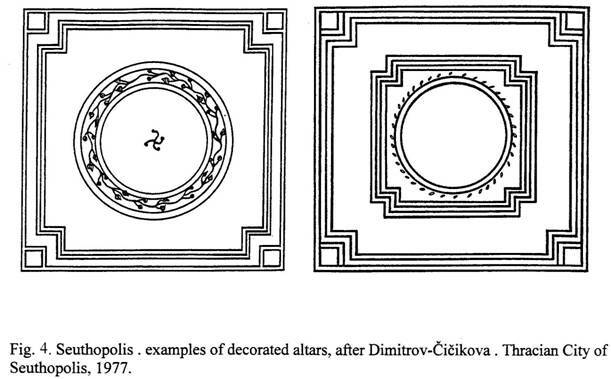 Also the altars of baked clay found there have parallels in Thracian cities (esp. Seuthopolis) but they were not usual in Greek towns. As we know from the chemical analysis of C.W. Beck, some fat with jasmin and rose oil was applied on them, like in the Hindu sanctuaries today. As for burials, the beginnings (6 th-5 th century B.C.) is marked by elaborate shaft graves containing exceptional objects of gold and silver (esp. Duvanli and Kaloyanovo); they were means of representation of the aristocracy before a more stable system of royal and princely administration could be established. A good parallel to the rich graves of the Duvanli region is the manor house at Vasil Levski, built of soft dressed stone and covered with glazed tiles. 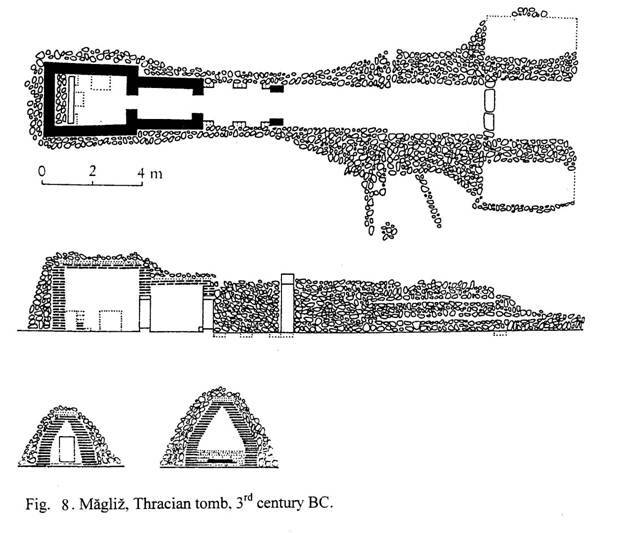 The late 5th century in Thrace is marked by the transition from shaft cist graves to tomb chambers constructed on the surface under tumuli – heroa, in which persons of the uppermost class were buried and their memory worshipped. The way from forts and villages to towns lasted longer The emporion Pistiros is a Greek foundation, though Greeks and Thracians lived there together. The citizens, cittadini, had to have laws and assemblies. The Pistiros inscription was for the Greeks, but also Thracians could see and read it publicly. The phenomenon of public inscriptions shows that the community of citizens was based on written laws and a juridical system; this is even more important characteristic of a city than urban planning (Archibald 1998). 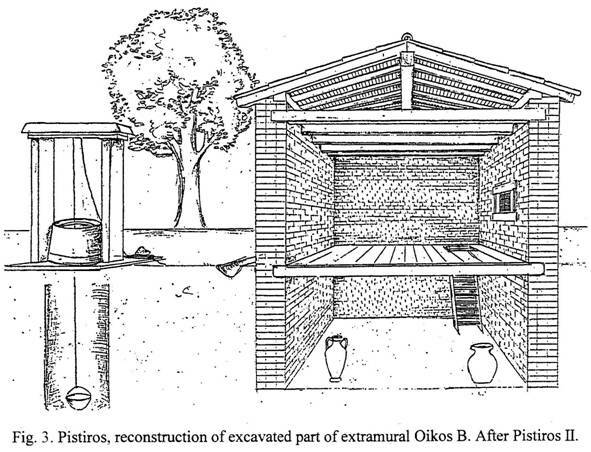 M. Domaradzki in his small book Emporion Pistiros II and in his contribution to the colloquium Pistiros and Thasos in 1998 mentioned several places, where an emporion may have existed due to some particular finds. One of his candidates is Arzos near Kalugerovo, on the right bank of the river Sazlika, where several dozens commercial lead documents of pre-Roman date have been found according to V. Gerasimova, but they are in private collections and not accessible to study. The second is Kočerinovo. A number of important objects from this village are in the collection of D. Dimitrov at Pernik, but, again, no scientific excavation has ever been made there. The tumuli with cremations and inhumations at Akandžievo show Attic lekythoi in some grave offerings. While the tumuli were normal in Thrace, the custom of last ointment of the dead body while lying in the grave was typical for the Greeks; Thracian burial ritual was different. The sanctuaries were religious centres and meeting points of those tribal units who did not develop cities even in Greece. There were also various special political relations between the Thracians and the Greek cities. Maroneia for example enjoyed a special position in relation to the Odrysian empire, for which it minted coins. The monumental tombs were built for heroes, mediating between the world of the living and the deities. 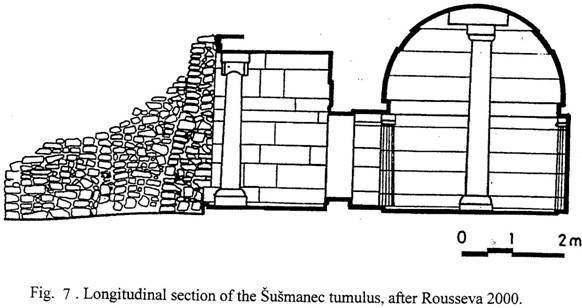 This situation reminds one of the Etruscan lucumones, who had tombs of similar construction (Naso, A. 1995). The social classes parallel to Dacian pileati and capillati apparently existed also in central Thrace south of the Haemus, and the clients depended on the chiefs, though the Gefolgschaft system enabled social mobility to able warriors. After the Celtic campaign, the rich graves of warriors, like the one uncovered at Plovdiv, show again that in this part of Thrace the system also enabled cooperation between Thracians and Celts; some of the latter were apparently accepted into Thracian society, though others founded the Tylis kingdom or the tribal princedom of the Scordici. 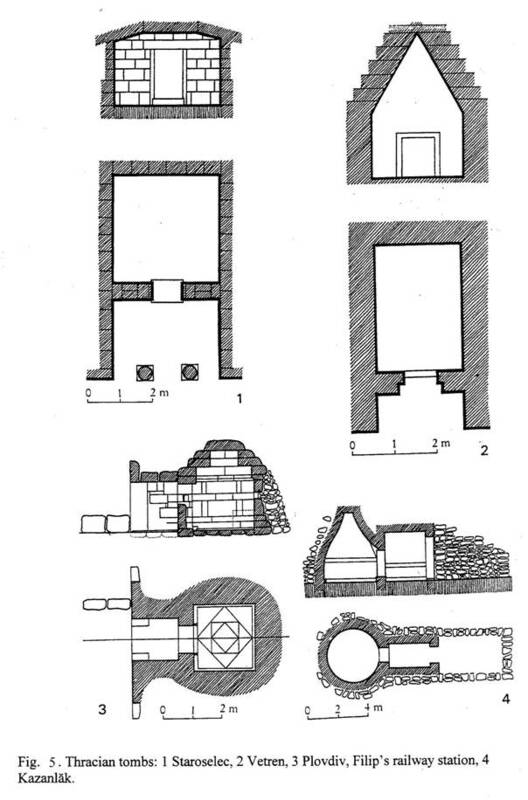 Seuthopolis as a new foundation was a real city with a regular plan, fully urban also when compared with Greek poleis, but with Thracian specifics like the hearth-altars, a phenomenon also known from Pistiros, and with a royal palace (Dimitrov – Čičikova 1987). Kabyle was slightly different due to its geographical position but it too was a real city at least from the time of Philip II. Velkov 1982). 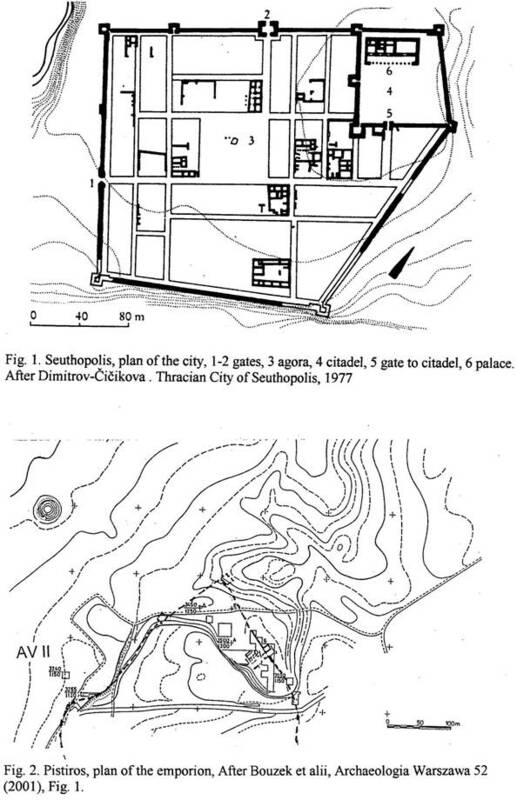 Pernik (Krakra, Čangova 1981; Domaradzki-Taneva 1998, 29-33) is still less well known, but its urban character cannot be doubted; its fortification is similar to that of Amphipolis, later in execution than that of Pistiros first phase. The situation of Nebettepe of Plovdiv is even less known, but the city may well have existed here already before Philip II.(cf. Domaradzki-Taneva 1988, 22-29). Other urban centres of the 4th century B.C. existed in Simeonovgrad (Asara) and Mezek (Kaleto), but they are much less known archaeologically. The manor house situated by the Mandren lake and investigated by P. Balabanov has already been mentioned among the Thucydidean thurseis. North of the Haemus, the first well-known Thracian city is Sborjanovo(Stoyanov 2000), which flourished in the 3 rd century B.C. Its fortifications (Fig. 4) indicate its special importance, but the interior of the city is only partly known, and it was not built in the regular (Hippodamean) urban system. Several – probably more modest – parallels to Sborjanovo exist in SE Rumania, but Sborjanovo may best be considered the capital of the royal dynasty of the Geti whose cemetery was situated in Sveštari The Šumen settlement may also have been urban in character, but it has not been investigated enough to provide clear evidence, and it is probably later than Bobata near Osmar (Domaradzki-Taneva 1998, 42; Antonova 1995). There was another important site in the area on the hill Carevec (Domaradzki-Taneva 1998, 43). The urban centres were connected by a system of roads (Fig. 5). They did not become independent political units with free citizens like the Greek poleis; they were dependent on the system of local kingdoms and dynasties, with the exception of Kabyle (the city minted its own coins). Urban centres where Thracians lived, often with some Greeks, existed in some parts of the Aegean coast fairly early, and later on the Black Sea coast (like Tyrzis on Cap Kaliakra, Balkanska 1980, Velkov 1982)) and on a larger scale in inland Thrace south of Stara Planina at least from the 4 th century B.C. As in Italy or in other parts of the Classical world, the Thracians too adopted urban life from their Greek neighbours. Thracians formed a substantial part of the population of Greek poleis in Thrace, notably in their choras, and Thracian aristocrats often received citizenship in Greek towns and sometimes even higher honours. The system did not change substantially with the conquest of Thrace by Philip II, and in Lysimachus’ time, even after the Celtic campaigns the system of tribal dynasts and aristocratic subreguli survived until the Roman conquest. In Hellenistic times, Thrace was a country participating intensively in the development of the Hellenistic koine in many respects. Because of its high level of cultural development, it could preserve many of its old traditions in religious beliefs and in burial customs even as a Roman province ( Cf. now a similar survey by Ch. Popov, 2002) . - 1986: Gradovete v drevna Trakija predi pochodite na Filip II, in: Poselišten život v Trakija, II. 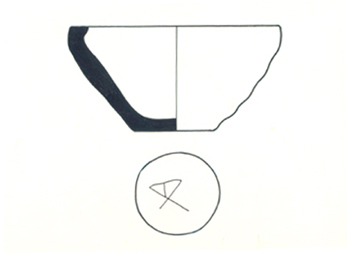 simpozium, Jambol 1986, 41-59. Balkanska, A 1974: Die thrakische Sztadt Tyrzis, Thracia 3 1974, 315-19. - 1996: Palastartige Anlagen im Schwarzmeergebiet, in: W. Hoepfner - G. Brands (eds. ), Basileia, Die Paläste der hellenistischen Könige, Mainz , 213-220. Domaradzki, M. 1982: Trakijski ukrepitelni s’or’ženija IV-II b. pr. n.e., in Prvi simpozium Poselišten život v Trakija, Jambol 1982, 44-59. Gotzev, A 1997: Characteristics of the settlement system during the EIA in ancient Thrace, in: Urbanisation in the Mediterranean in the 9 th to 6 th centuries BC, Acta Hyperborea 7 (1997), 407-421. Popov, Ch. 2002:Urbanizacija v’v v’trešnite rajoni na Trakija i Ilirija (Urbanisierung in den inneren Gebieten Thrakiens und Illyriens). Sofi a, Nous publishers. Velkov, V. 1982a: Das antike Siedlungsleben in Thrakien, Klio 64, 60-64. Venedikov, I. 1946: Trakijska grobnica pri s. Vetren, Izvestija na B'lgarski archeologičeski Institut 15, 194-196. Schauer, P. ed. 1995: Archäologische Untersuchungen zu den Beziehungen zwischen Altitalien und der Zone nordwärts der Alpen während der frühen Eisenzeit Mitteleuropas, Regensburg 1994 (1995). The review of epigraphic evidence, of over 140 epitaphs from 6 th /5 th c. B.C.-3 rd c. B.C. give us the opportunity to make interesting observations on the ethno-social structure of the population. From the Greek colonies on the Black Sea we have about 130 epigraphic monuments (in IGBulg. I, V – passim). They are predominantly dedicated to Greek citizens of the colonies, but there are a few exceptions, giving us interesting information about Thracian liberated slaves (in Messembria, e.g. IGBulg I. 334 novies) or about women bearing Greek names, but with Thracian patronyms (e.g IGBulg. I, 438, Apollonia). There are only about ten inscriptions from the Thracian inland dating from the abovementioned period. One of them is dedicated to a noble Thracian woman: it is a recently discovered unique epitaph, written on an architrave from the tomb of a noble Thracian named Gonimasedze. It was found in the surroundings of the village Smyadovo, Shoumen district, in modern northern-east Bulgaria. The inscription reads: “Gonimasedze, wife of Seuthes” and dates back to the end of 4 th c. B.C. and the beginning of 3 rd c. B.C.) (Atanasov, Nedelcev 2002, 550-557) (Fig. 1). We do not have on our disposal any other funerary monuments from the area and the period in consideration. But we have some evidence about personal names of some representatives of the population in the biggest centre from the region north of Haemus, the Thracian fortified settlement, regularly excavated near the village of Sboryanovo (Stoyanov 2002, 207-221; Stoyanov 2003, 413-424). 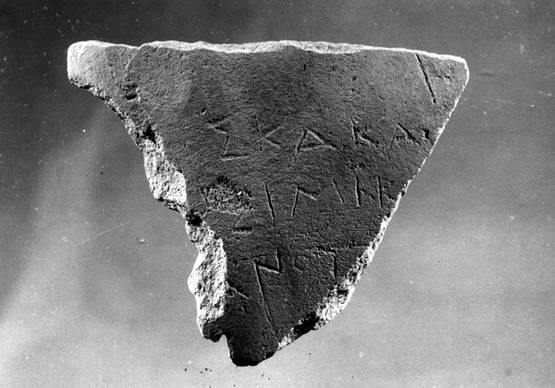 Some personal names are attested on ca.20 graffiti on pottery sherds, discovered on the site. One of them is Teres (Fig. 2), known as a Thracian king’s name, but, obviously spread and fashionable amongst the common people as well. The other one is Skakas, unattested in other epigraphic monuments neither in Thrace, nor in other areas, probably a personal name with a local origin (Fig. 3). On the south of the Haemus mountains the epitaphs are eight. The earliest one is an epitaph of Antiphanes, son of Cherandros (the end of 5 th c. B.C.-the beginning of 4 th c.B.C. 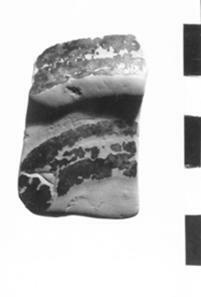 found near Parvenec, Plovdiv region) (SEG 1996, 483; Domaradzka 1993, 57, no. 6) (Fig. 4). These rare epichoric names, and particularly Herandros, suggest the presence of a citizen of Eretria on the island of Euboea, or, more probably, of Thasian colony Stryme. Judging by these rare epichoric names and particularly by one of them – Herandros, we can make highly probable suggestions concerning the origin of the deceased, mentioned in the inscription. The latter name is documented only once on Eretria, in an epitaph dating from early 4th century B.C (IG XII, fasc. IX, no. 371) and recently, in the epitaph of Northern Greek polis Stryme, a Thasian colony (LGPN vol. IV, Stryme?, V/IV BC, IThrakAigE128). 2. Athenagores (Fig. 7:1) (LGPN I, sv. (1-3) Chios, or (4) Samos, the name is particularly well represented in 5 th to 5 th c. BC Thasos (5-11);see Poulloux 1954, 282 ff., esp. Catalogue 1, theoroi of the Classical period, (col. iv, 38, 48). 13. Maron (Fig.7:7) (IGBulg. III 2, no. 1812, 1821, but dated to the Roman era; see Manov 1993, 40-49 for the graffito from the Classical period from Nessebar). 16. someone son of Metrophon Metrophon (Domaradzka 1996, Pl. XXVIII: 6.1; eadem 1999, 347-358). The analysis of the data provided by the graffiti from Pistiros placed in connection with other epigraphic and archaeological evidence from this site shows a good example how invaluable information could be extracted from these materials. The collecting of graffiti from various archaeological centers in Thrace dated from the pre-Roman epoch, and their comparison with the relatively less but tending to enlarge in number monuments on stone from the same period, could enable us to understand better the development of Greek script and language during the Classical and Early Hellenistic times, the religious beliefs, thoughts and other unknown elements of everyday life of the common people in Thrace. Elements of funeral customs of both Greeks and Thracians have been found in the surroundings of Pistiros. 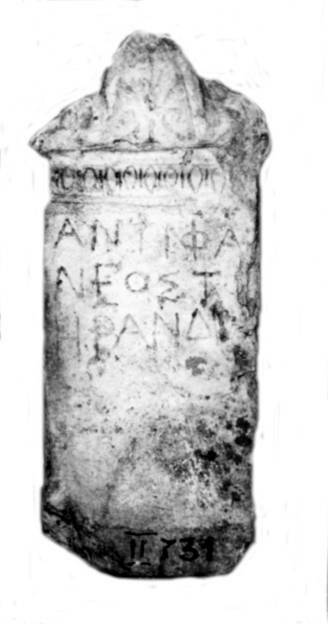 The above-mentioned funeral inscriptions discovered in Pistiros suggest the possible existence of a flat necropolis used by Hellenic population. The vaulted tomb near Pistiros and the tomb near Belovo are evidence of the funeral customs characteristic of a Thracians. The situation concerning the necropolis (14 mounds dated from the 5 th to the 3 rd c. BC) in the Ilovitzata locality near the village of Akandzhievo (Fig. 9) is however, more complicated. (Domaradzki 2003, 105-114; Gizdova 2005, 115-122) (I would like to acknowledge here the opportunity I was given by Ms. N. Gizdova to get acquainted to the pottery and the graffiti from the necropolis in Akandzhievo; the article regarding the results of the research of this necropolis is forthcoming in volume 38 of the Bulletin of the Archaeological Institute). The element distinguishing it form the rest of the Thracian necropoleis in the region is burial inventory. The graffiti on imported (Fig. 10 a) and on local wheel-made vessels (Fig. 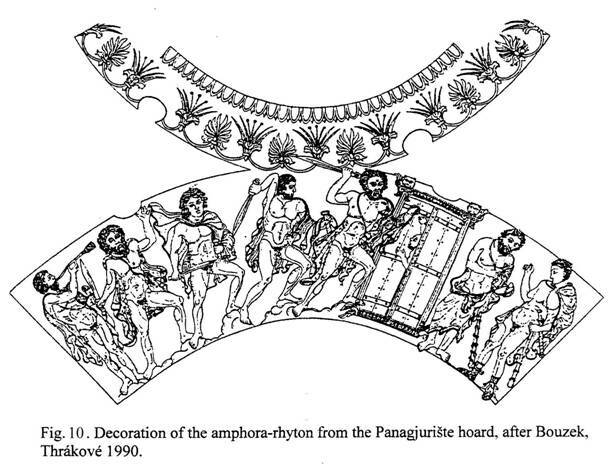 10 b) add to the picture of elements unusual for Thracian graves from the region in this period. It is thanks to the results from the excavations of Pistiros that the ethnic interpretation of the necropolis near the village of Akandzhievo became possible. We have an excellent example of the sophisticated cultural processes in Pistiros and its surroundings (Domaradzki 2003, 105-114). It can be concluded that a number of ethnic and professional groups lived in the Thrace as indicated by the variety of the terms used in the Vetren inscription. Pistiros of the Vetren inscription was a permanent settlement. Archaeological finds and epigraphic data suggest that inhabitants from Greek poleis along with the Thracians have both lived in Pistiros for a long time and have died there. The inhabitants of Pistiros kept close relations with the Oracle of Dionysos and were subjects to the Thracian ruler. The material culture that comes to light in Pistiros is comparable to that of the poleis which were Greek colonies while its stone architecture, reminding that of Thasos, is a clear proof of the wealth and affluence of its citizens who, in the 5th-4th centuries BC, strove after the model of material and cultural life in the Greek centres. 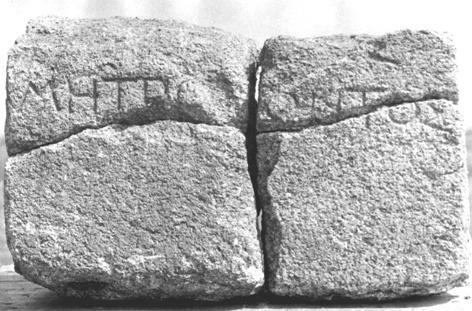 We have another two epitaphs from the Chirpan region, from Spasovo and Saedinenie, containing Greek names- Diotimos son of Sozis (IGBulg III.2, 1639) and a fragmentary inscription (dated from IV c. B.C. )(IGBulg III.2, 1635). A piece of a funeral epigram is found in Taja, Kazanluk region (III c. B.C., about Spartokos and his beautiful horses), which is probably dedicated to a Thracian nobleman (IGBulg V, 5612 bis=1730). From Alexandrovo, Haskovo region, originates a newly discovered epitaph, a graffito, tidy and hardly visible written by an unknown Thracian and dedicated to a friend or a relative of his, who had recently passed away (Kitov 2004, 42-51; Sharankov 2005, 29-35). It was incised on the wall-paintings in the round chamber right across the entrance and placed at a high of ca. 1.70 m above the floor of the chamber (Sharankov 2005, 29). The two-line epitaph is redacted in the style of the Greek funerary inscriptions of the epoch and reads: “Kozimases chrestos“. The personal name Kozimases is a two-root name of Thracian origin. Its first component Kozi- and variants Kozei-, Kosi- is attested with several examples (Sharankov 2005, 29-30; Dechev 1957, 249; see also in Domaradzka 2005 a, 299, fig. 7 a graffito reading KOZI, inscribed on the bottom of a grey local wheel-turned vessel from the settlement site near the village of Lessovo, Jambol region, dating to the 4 th c.BC). These are all evidence of the complex processes leading to mutual influence between co – inhabiting Thracians and Greeks, which led not only to hellenisation of the Thracian ethnos in the Greek colonies, but also to the acceptation of many aspects of the Thracian culture from Greek colonizers, living in Thrace. It is because of those epigraphic monuments that ordinary people originating from Greek poleis such as traders, sculptors, artists, craftsmen, masons and representatives of various professions, for whom we could only hypothesize that they found their new home-land in Thrace, are now coming into light. What remains for us is the hope that in the future archeological and epigraphic evidence will further enrich our knowledge about the ethno-social structure of the population in Thrace in the Classical and Hellenistic period. Atanasov, Nedelchev 2002: Atanasov (G.), Nedelchev (N.). -Gonimaseze – zhenata na Sevt i nejnata grobnica. In: Giceva (R.), Rabadzhiev (K.) (eds.) Studia in honorem prof. Ivani Marazov, Sofia 2002, 550-557. Bechtel, 1917: Bechtel (F.). –Die historischen Personennamen der Griechischen bis zur Kaiserzeit. Chankowski, Domaradzka 1999: Chankowski (V.), Domaradzka (L.). Réédition de l’inscription de Pistiros et problemès d’interprétation. – BCH 123 (1999), 247-251. Detschew 1957: Detschew (D.). –The thrakischen Sprachreste. Wien. Domaradzka 1993: Domaradzka (L.). Inscriptions découvertes dans le haut de Maritza (ancient Hébros). Archeologia (Warszawa) 44 (1993), 55-57. Domaradzka 1996: Domaradzka (L.). Graffiti from Pistiros. – In: Bouzek (J), Domaradzki (M.), Archibald (Z.). (eds.). Pistiros I. Prague 1996, 89-04 with pl. XXVIII-XXXI A.
Domaradzka 1999: Domaradzka (L.). Monuments épigraphiques de Pistiros. - BCH 123 (1999), 347-358. Domaradzka 2002: Domaradzka (L.). 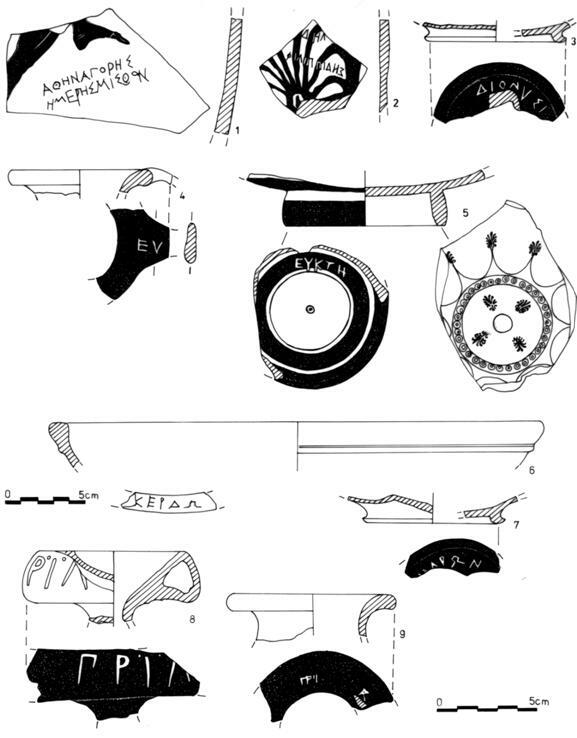 Catalogue of graffiti discovered during the excavations at Pistiros-Vetren 1988-1998. Part one: graffiti on imported fine pottery, with pls. 44-50. In: Bouzek (J), Domaradzka (L.), Archibald (Z.) (eds.) Pistiros II. Prague 2002, 209-228. Domaradzka 2005 a: Domaradzka (L.). Greek Classical and Hellenistic Graffiti from Thrace (6 th/5 th – 3 rd c. BC). In Sthephanos archeologicos in honorem Professoris Liudmili Getov. Studia Archaeologica Universitatis Serdicensis. Suppl. IV. Sofia 2005, 296-307. Domaradzka 2005: Domaradzka (L.). Graeco-Thracian relations in the Upper Maritza valley (5 th – 4 th c. B.C.). In: Bouzek (J. ), Domaradzka (L.) (eds.). The Culture of Thracians and their Neighbours. Procedings of the International Symposium in Memory of Prof. Mieczyslaw Domaradzka, with a Round Table “Archaeological Map of Bulgaria”. BAR International Seroes 1350. Oxford 2005, 19-26. Domaradzki 2003: Domaradzki (M.) Garcite v Trakia. – Studia in memoriam Dr. P. Gorbanov. Studia Archaeologica Universitatis Serdicensis. Suppl. I. Sofia 2003, 105-114. Gizdova 2005: Gizdova (N.). Thracian tumuli in the Pazaedzhik district. In: Bouzek (J. ), Domaradzka (L.) (eds.). The Culture of Thracians and their Neighbours. Procedings of the International Symposium in Memory of Prof. Mieczyslaw Domaradzka, with a Round Table “Archaeological Map of Bulgaria”. BAR International Series 1350. Oxford 2005, 115-122. IGBulg. = Inscriptiones Graecae in Bulgaria repertae, ed. G. Mihailov, vol I 2-V. Serdicae 1958-1997. IGXII.9 = Inscriptiones Graecae, vol. XII, fasc. IX. Inscriptiones Euboeae insulae, ed. E. Ziebarth. Berolini 1915. Kitov 2004: Kitov (G.). Novi nabljudenija v Alexandrovskata grobnica. – Arheologia, (Sofia) 2004, 1-2, 42-51. LGPN = Fraser (F.), Matthews (E.). A Lexicon of Greek Personal Names, vol. I. The Aegean Islands, Cyprus, Cyrenaica 1987; vol. II Attica, edd. Osborne (M.J.), Byrne (S.G.); vol. 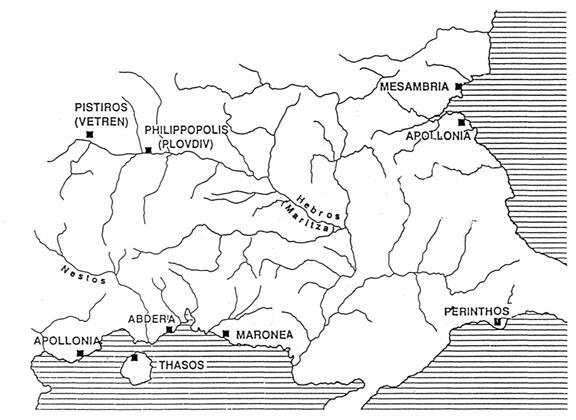 III A, The Peloponnese, Western Greece, Sicily, and Magna Graecia; III B, Central Greece:from Megarid to Thessaly; vol. IV. Macedonia, Thrace, Northern regions of the Black Sea. (Oxford 1987 – ). SEG = Supplementum Epigraphicum Graecum, vol. XLIII, Amsterdam 1996. Sharankov 2005: Sharankov (N). 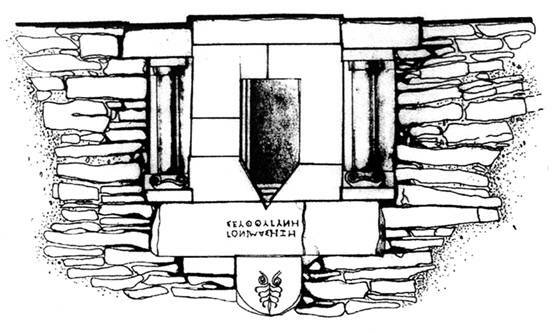 A Greek Graffito in the Thracian tomb near Alexandrovo. Archaeologia Bulgarica, 1, (Sofia) 2005, 29-35. Stoyanov 2002: Stoyanov (T.).-The Getic Capital at Sboryanovo (NE Bulgaria). In: G.R.Tsetskhladze, J.G.de Boor (eds.) Black Sea Region in the Greek, Roman and Byzantine Periods. TALANTA Proceedings of the Dutch Archaeological and Historical Society, vol. XXXII, 2000-2001, 207-221. Stoyanov 2003: Stoyanov (T.).-The Getic Capital at Sboryanovo:new excavation issues and research. In: Thracia XV, Sofia 2003, 413-424. Velkov, Domaradzka 1994: Velkov (V.), Domaradzka (L.). Kotys I (383/2-359) et l’emporion de Pistiros en Thrace. – BCH 118 (1994), 1-15. Fig. 1. Smyadovo, Shoumen district. Epitaph of Gonimaseze, wife of Seuthes (4 th c. BC). (after Atanasov&Nedelchev). Fig. 2. Sboryanovo. 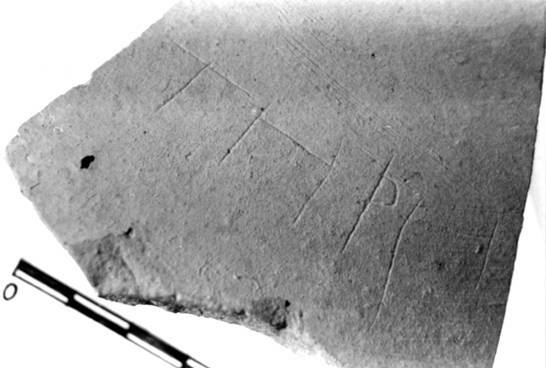 Graffito with Thracian name Teres. Fig. 3. Sboryanovo. Graffito with local names. Fig. 4. Parvenec, Plovdiv region. A stele of Antiphanes, son of Herandros (5 th-4 th c. BC). Fig. 5. Funerary inscriptions from Pistiros. Fig. 6. Map of Thrace. Fig. 7. Pistiros. Graffiti with Greek personal names. Fig 8. Pistiros. Graffiti with Thracian names. Fig. 9. 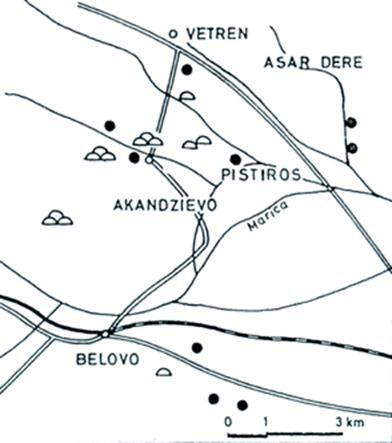 Pistiros, Akandzhievo and contemporary sites.